Celebrating the New Year in style! As we joined the other passengers assembled on the red-carpeted platform, a traditional toast of champagne and orange juice set the mood, while a trio of violinists provided soothing classical music for a memorable send off. Mr. Vos gave a hearty "bon voyage," announcing each guest's name in turn as we boarded the train. Many nations were represented that morning - the UK, Norway, Italy, Australia, USA, Switzerland, Spain, Germany, France, South Africa and Canada. These vintage coaches have carried royalty on past tours, and we soon discovered there was a European countess among us, which reflects the company's claim "the most luxurious train in the world. A mild thunderstorm was brewing above Table Mountain, and as rain began to beat on the windows, the train pulled away from Cape Town station. Have no fear, I had a feeling that the trip would be even more enjoyable, looking out from our cozy cocoon on wheels. My intuition proved to be quite true. Talk about individualized service from Rovos' team of young, attractive hostesses. Our baggage was waiting in the cabins, plus champagne, a fruit bowl, chocolates and terry cloth robes. Private suites on Rovos Rail are spacious, elegant, fully equipped and finished in highly polished wood panels, with amazing attention to detail. Some of these vintage coaches date back to 1911, and all are beautifully restored. Full sized beds face three large picture windows that open easily, bathing the room with fresh air and daylight as you view the changing landscape, or allow perfect privacy as needed. The writing desk was ideal for my lap top computer, and the in-suite telephone came in handy. Outside Muguette Goufrani's suite, a brass plaque bore the title "The Cullinan," after the world's largest gem diamond, discovered in 1905, and named for mine owner Sir Thomas Cullinan. My private suite was titled " The Etosha," in honor of Namibia's national park. As Mr. Vos says, "It is an atmosphere of good food, good wine and good conversation that we are striving to create. " Like Pavlov's dog, and personal memories of cruises on the Alaska coast, a soft gong in the passageway signaled that dinner was being served. Naturally,on Rovos Rail, semi formal dress was the order of the day, and as we took our seats, a red roses was pinned on each lapel. After all, this was a glorious land cruise - and the superb menu featured such local game dishes as Springbok with lemon honey sauce, plus others like South African Botobie and Kingclip in Pernod cream. It goes without saying that the wine list was extensive, and drinks were complimentary for the entire trip, throughout the train. The vistas were spellbinding. Having read Covenant by James Michener, several Wilbur Smith sagas and various other books on South Africa, I was aware that the 900-mile rail journey follows the old pioneer trail from Cape Town north, via Paarl, Worcester and South Africa's bountiful Winelands, wending its way through the Hex River Valley to the interior's higher, drier Karoo country. What I did not expect was the fact that there were some exceptionally long tunnels en route. Just imagine the engineering challenges and effort that was involved in early railroad-building in this area. A pleasant surprise was our brief stop at the historic village of Matjiesfontein, which resembles a romantic movie set, with its street of carefully restored buildings, such as the Victorian Lord Milner Hotel, with lush gardens and a friendly pub nearby. I couldn't help imagining that Miss Kitty of Gunsmoke would come through the red velvet curtains and descend the ornate staircase. Several of us could have spent all day at the nearby museum, checking out relics of pioneer days, before, during and following the Anglo Boer War and the frantic gold and diamond rushes. It was hard to imagine that the rich and famous of the world came here 100 years ago, when it was a thriving health resort. Well, we've been told a renaissance is underway. Speaking of journeys into history, our next major stop was at Modder River station, a lonely spot where the Boers and British once clashed in a major battle. 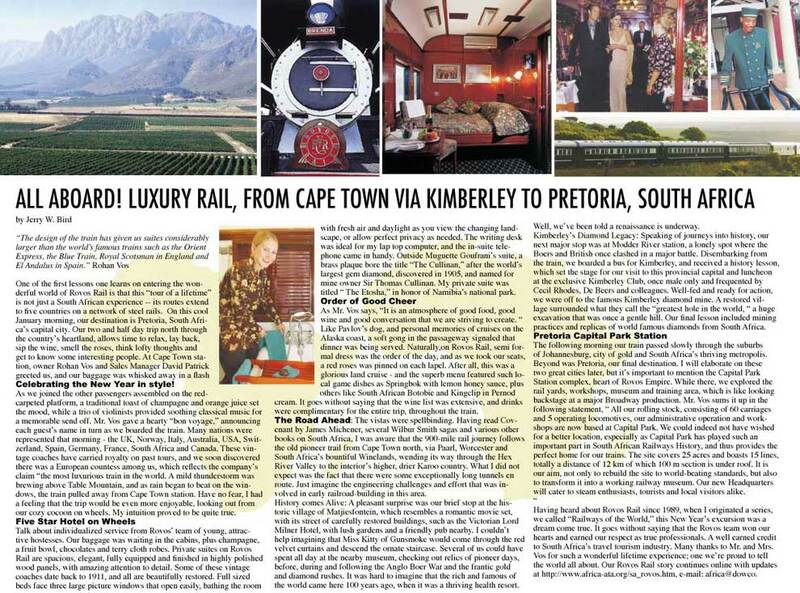 Disembarking from the train, we boarded a bus for Kimberley, and received a history lesson, which set the stage for our visit to this provincial capital and luncheon at the exclusive Kimberley Club, once male only and frequented by Cecil Rhodes, De Beers and colleagues. Well-fed and ready for action, we were off to the famous Kimberley diamond mine. A restored village surrounded what they call the "greatest hole in the world, " a huge excavation that was once a gentle hill. Our final lesson included mining practices and replicas of world famous diamonds from South Africa. The following morning our train passed slowly through the suburbs of Johannesburg, city of gold and South Africa's thriving metropolis. Beyond was Pretoria, our final destination. I will elaborate on these two great cities later, but it's important to mention the Capital Park Station complex, heart of Rovos Empire. While there, we explored the rail yards, workshops, museum and training area, which is like looking backstage at a major Broadway production. Mr. Vos sums it up in the following statement, " All our rolling stock, consisting of 60 carriages and 5 operating locomotives, our administrative operation and workshops are now based at Capital Park. We could indeed not have wished for a better location, especially as Capital Park has played such an important part in South African Railways History, and thus provides the perfect home for our trains. The site covers 25 acres and boasts 15 lines, totally a distance of 12 km of which 100 m section is under roof. It is our aim, not only to rebuild the site to world-beating standards, but also to transform it into a working railway museum. Our new Headquarters will cater to steam enthusiasts, tourists and local visitors alike. " It goes without saying that the Rovos team won our hearts and earned our respect as true professionals. A well earned credit to South Africa's travel tourism industry. Many thanks to Mr. and Mrs. Vos for such a wonderful lifetime experience; one we're proud to tell the world all about. Our Rovos Rail story continues online at http://www.africa-ata.org/sa_rovos.htm, e-mail: africa@dowco.